That Which Sleeps is a turn based strategy game in which the player takes on the role of an awakened evil from the world's past and must manipulate a living, reactive world from the shadows using a variety of corrupted agents as well as what armies he can muster to his cause. Players must balance an aggressive approach utilizing his considerable powers with the need for secrecy - heroes are constantly examining clues left behind by the actions of the old one and eagerly hunting the player's agents. As the time comes to herald your return, the Chosen One will lead what remains of the world to stop you - will you be ready? We've already seen how you can manipulate the various nations and states of the a That Which Sleeps scenario but there are also other factions that further complicate the world. Orders, Guilds, and Cabals exist throughout the world, headquartered in a POI and spreading their guildhouses, chapterhouses, and cells to other POIs. These international organizations pursue agendas, some of which are beneficial to you and many of which are not. Let's take a look at some of these. 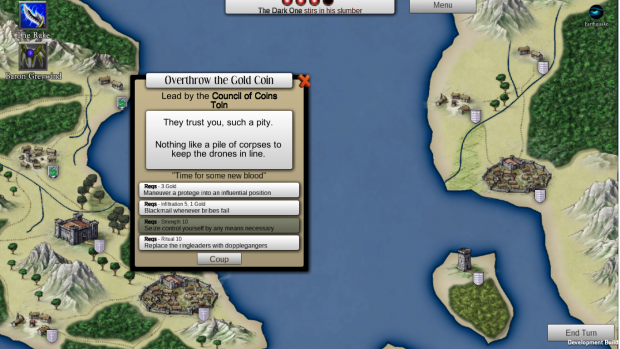 Guilds are the most common structures and pursue a single agenda based on their type, the Gold Coin (pictured above) is a Merchant Guild and wants to be in cities with a lot of trade. Guilds are able to grant you influence based on their type, a Merchant guild can give you a huge influence boost in a state that has a lot of trade. Guilds build guildhalls to expand and do so often, they do not coexist pleasantly with other guilds of the same type. Guild wars are a great way to cause large scale disruption of civic life, lowering stability without attracting attention your way. Guilds can be infiltrated easily as a Tier 2 Infiltration challenge, and once infiltrated provide a spy in every POI with that guild in it. An infiltrated guild can be Overthrown with a Tier 1 Infiltration challenge at the Guild Headquarters POI, resulting in the display above. 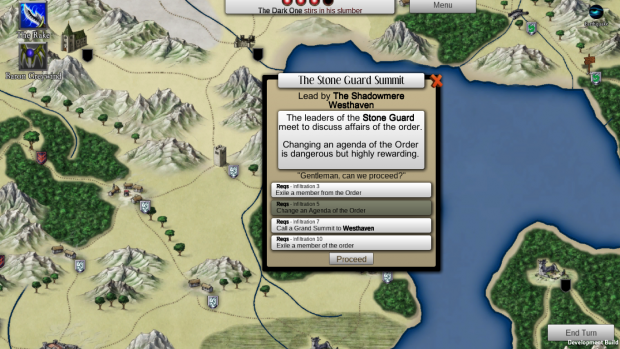 Your decision on how to overthrow the Guild is important, the stronger your control the more suspicious it is and the more clues generated for heroes.Once in control of a Guild you will be able to determine what actions the Guild takes at certain intervals, or perform a Tier 1 infiltration challenge to immediately force an action. The longer you are in control of the guild, the lower the costs of taking the actions. Orders are founded with specific Agendas in mind, and receive three of them that determine the general cause and abilities of the Order. This makes them far more malleable than Guilds, but also more powerful in the hands of your enemies. Orders are generally more difficult to infiltrate and overthrow than guilds, and do not have the same global spy infiltration bonus that Guilds do. However, an infiltrated Chapterhouse of an order will lower order in that POI and give you support during any combat with heroes. 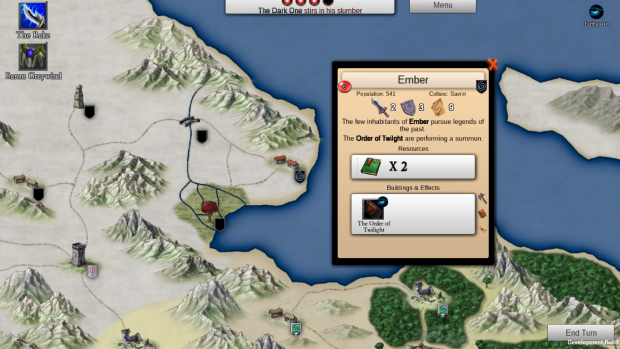 Agendas can be swapped out if you control the Order Headquarters, but causes suspicion and sends discontent through the order based on the number of Chapterhouses you have infiltrated. Own them all, however, and you can turn a Demon Hunting order of Paladins into the most feared Inquisitors on the continent. With the proper Ritual skills you can take the corruption even further. Heroes join Orders and gain new classes and abilities from them, but if you are head of the order you can call a Grand Summit and bring all the heroes together. Good to distract them from a hunt, or possibly to lure them together to end a threat once and for all. Cabals are the last of the independent organizations, and are the simplest but often most powerful. Cabals are mystical organizations that support their particular Agenda, but mostly are landmarks for lore bonuses, gaining new spells, and quest points. Infiltrating and Overthrowing a cabal can be difficult, requiring Ritual challenges but can be particularly rewarding for the Old One. You can direct spell research to something useful for your agents, summon powerful minions, or spread a devastating cell of the Cabal to a vulnerable POI. Cabals, when independent, are often one of the stages for quests. Heroes may destroy the cabal, recruit them to the Alliance, or simply use them to gain magic items or spells. Summary: We wanted to have some more fun ways to interact with the world that both round out the strategic options but also are extremely thematic. Infiltrating a thieves guild, turning them into an assassin's guild, and then recruiting a horde of murderers is FUN and that's all I need to know. Personal Note: Finally all moved in to the permanent place in Austin, Texas - back to full time development.